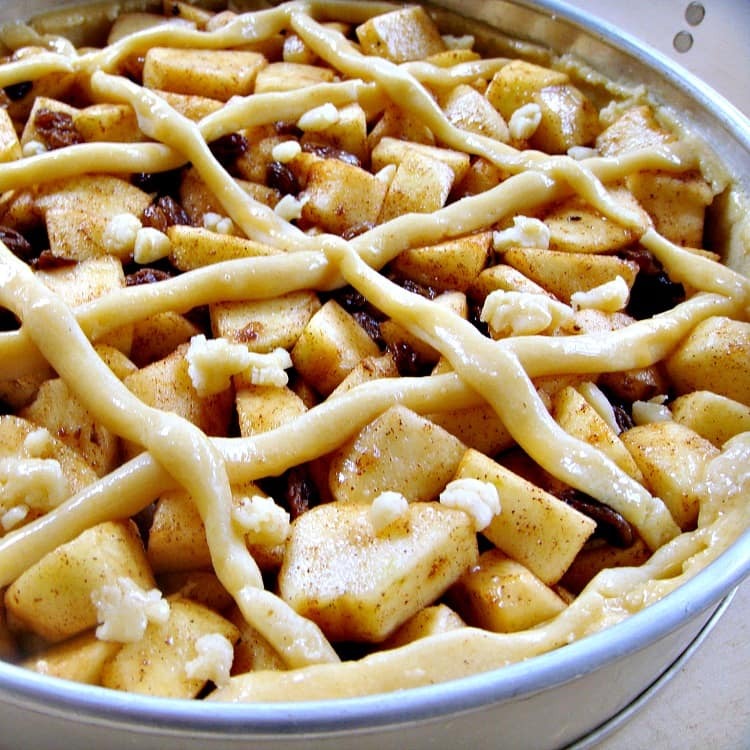 Dutch Apple Pie! 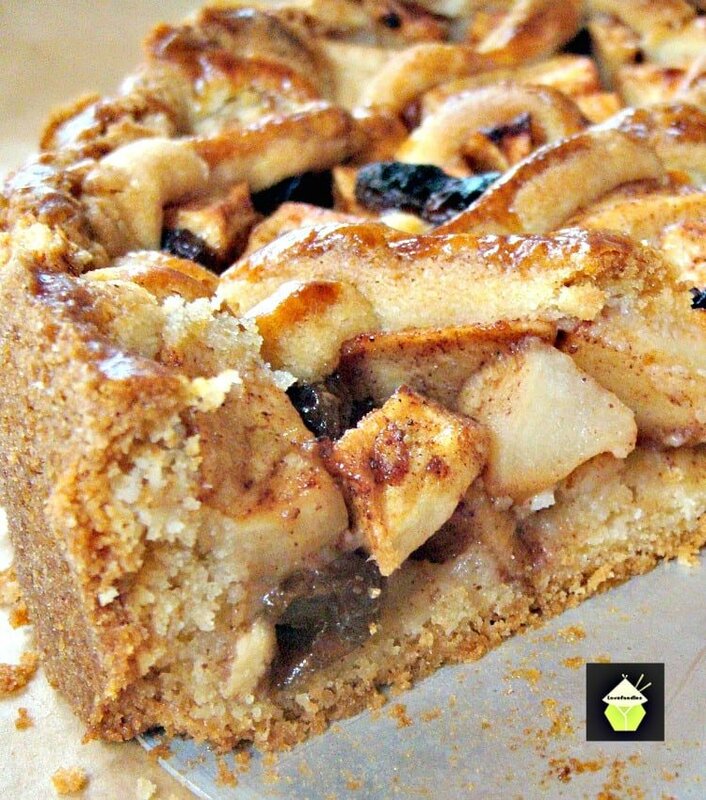 Loaded with apples, raisins, cinnamon and the most delicious pastry I’ve ever eaten! Be sure to have a lovely cup of coffee to go with a slice of pie in true Dutch tradition! It seems wherever you go in Holland, you will be warmly welcomed with a slice of Dutch Apple Tart or Pie! It’s a very popular dish and you would normally eat it with a mid morning coffee or mid afternoon. Should you ever visit a Dutch person, don’t be surprised if you are offered a piece of their home made apple pie. 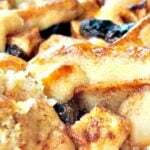 It’s a wonderful recipe, with a slight crunch texture from the pastry, the flavour of cinnamon and the slight sharpness of the apples. The pie itself is not dry at all because it is absolutely loaded with juicy apples and sultanas. The pastry is crumbly and buttery and just melts in your mouth. It really is quite a pie! If you have lots of apples, it is worth making a few of these pies and freezing them, either before or after baking, either way will work well. Serve on its own with a cup of Dutch coffee, or have as a dessert, warm or cold, with a blob of whipped cream or ice cream. Please enjoy! Easy to put together, and looks super! So let’s see how easy this pie is to make. 2 eggs (1½ is for the pastry & ½ for egg wash before the oven). 1. Preheat the oven to 170 C / 325 F / Gas 3. Grease your baking tin. First we make the pastry. 2. Mix the flour, softened butter, sugar, cinnamon and 1½ eggs in a bowl. Mix with your hands until you get a smooth soft dough. Split the dough so you have 3/4 for the cake tin and 1/4 for the top decoration. 3. Roll out 3/4 of the dough to cover the bottom and sides of the tin. 4. Peel, core and slice the apples. Mix this with the sugar, sultanas / raisins and cinnamon. Place all of it in the cake tin and spread evenly. 5. Roll out the remaining dough and cut into long strips, each about 1cm wide. Put in a lattice pattern across the pie like in the photo, weaving them in an over-and-under pattern. Use the shortest strips for the edges of the lattice. Press the ends of the strips firmly to the edge of the pie and trim away any excess dough with a knife. Brush the pastry strips with remaining (beaten) egg. 6. Place in the oven for about 60 minutes or until pastry is light brown. Preheat the oven to 170 C / 325 F / Gas 3. Grease your baking tin. Mix the flour, softened butter, sugar, cinnamon and 1½ eggs in a bowl. Mix with your hands until you get a smooth soft dough. Roll out 3/4 of the dough to cover the bottom and sides of the tin. Peel, core and slice the apples. Mix this with the sugar, sultanas / raisins and cinnamon. Place all of it in the cake tin and spread evenly. Roll out the remaining dough and cut into long strips, each about 1cm wide. 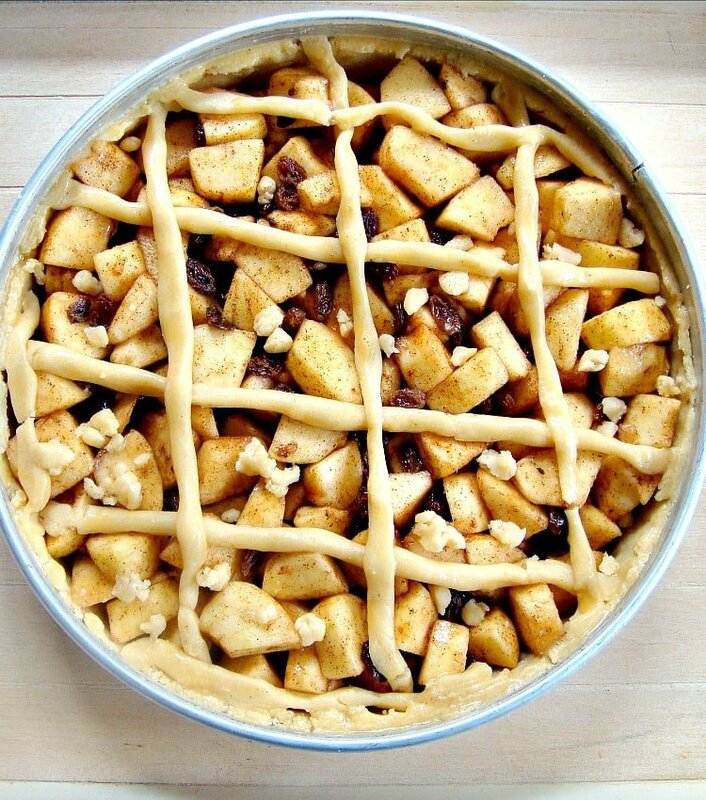 Put in a lattice pattern across the pie like in the photo, weaving them in an over-and-under pattern. Use the shortest strips for the edges of the lattice. Press the ends of the strips firmly to the edge of the pie and trim away any excess dough with a knife. Place in the oven for about 60 minutes or until pastry is light brown. I have made this a few times now. I have always used about a cup more apples, added a cup of walnuts and since we are crazy for cinnamon I tripled the amount. It is amazing!! Thank you so much for sharing this recipe. 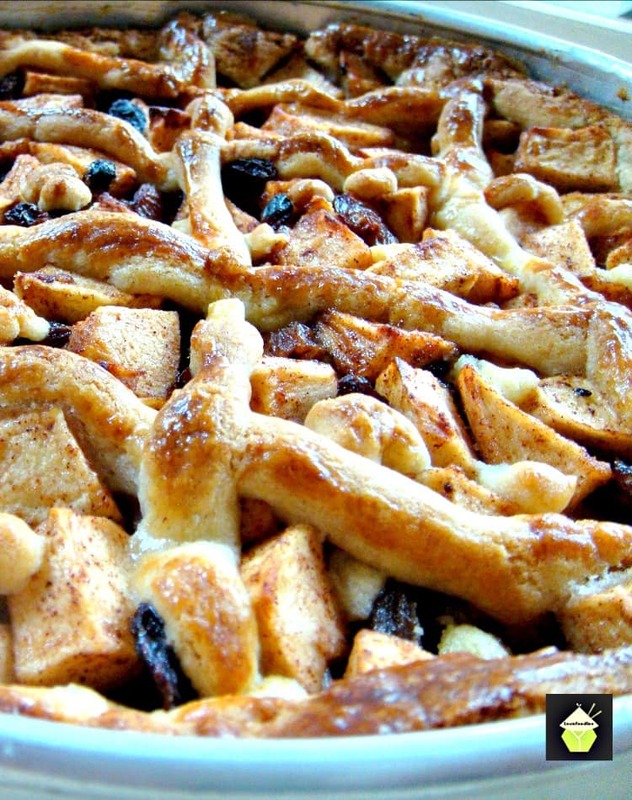 This pie looks so good, I keep the recipe in mind for later! This pie looks incredible! I can only imagine how amazing it tastes! Hi Barbara, thank you, I’m happy you like the recipe. The best thing to do is break ONE egg and beat it. Then take half out and set aside. This half that you set aside is for the egg wash over the top of the pastry. The other half is to add to the other whole egg for the pastry ingredients. I hope that helps! Happy baking and I hope you enjoy the pie! Thank you Mary… I will give it a try! I just adore this recipe. I have never ever made any apple pie so was a bit apprehensive but let me say, you made me look good! It turned out beautifully! So rustic and so easy! I really don’t know if I can try another recipe to be honest. If it isn’t broken, why try fixing it! Thank you. Thanks Tracy, you are a good cook, so I am very proud you liked the recipe! It’s certainly a very delicious pie, in Holland, it is often served with a blob of whipped cream and a coffee!